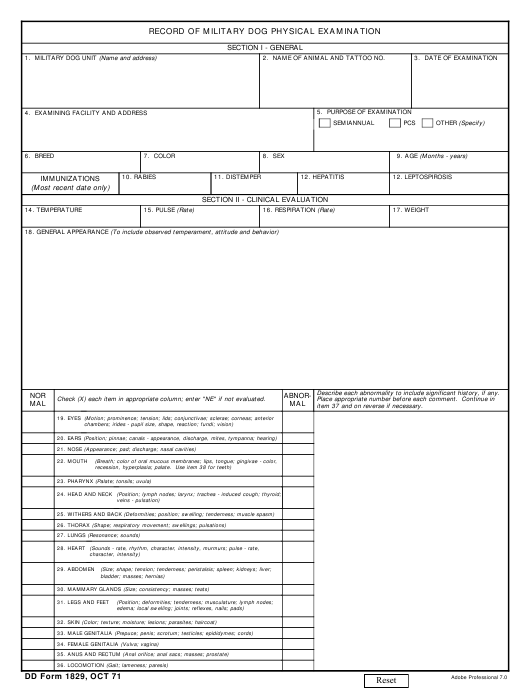 DD Form 1829 - also known as the "Record Of Military Dog Physical Examination" - is a United States Military form issued by the Department of Defense. The form - often incorrectly referred to as the DA form 1829 - was last revised on October 1, 1971. Download an up-to-date fillable PDF version of the DD 1829 below or request a copy through the chain of command. 2. NAME OF ANIMAL AND TATTOO NO. Describe each abnormality to include significant history, if any. Check (X) each item in appropriate column; enter "NE" if not evaluated. item 37 and on reverse if necessary. 39. CHECK THOSE PROCEDURES PERFORMED AS PART OF THIS EXAMINATION; SEE REPORTS FILED IN RECORD FOR RESULTS.